Find hotel near Museum Of The Asian-afric .. 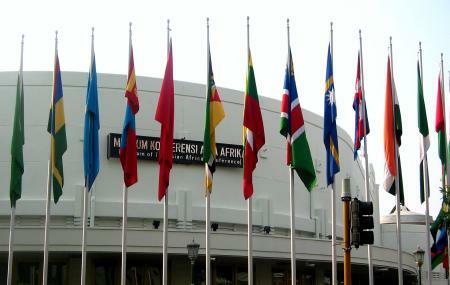 The venue for the historic first Asian African Conference held in 1955, this museum is now recognized as tone of the milestones in the world history. Bringing together 29 Asian and African countries, this conference was one of the pioneers of peace during the turbulent times of cold war.In order to remind the world and to continue to act on the principles of the Bandung Declaration, the venue of this memorable first Asian African Conference – Gedung Merdeka - was made into a Museum to become a continuous source of inspiration for the world, and in particular for Asian and African nations. With lots of collectibles, paintings, memoirs and photographs from the conference, today, the museum is a epitome of modern day Indonesian culture. Also, visit the popular attractions in the city by following Bandung itinerary 1 day. The events may have separate entry fees. How popular is Museum Of The Asian-african Conference? People normally club together Kawah Putih and Geology Museum while planning their visit to Museum Of The Asian-african Conference. Thank you for the nice place and well prepared tour guide to help us to know more of the history of Indonesia especially of what happened in Bandung. It helps me appreciate more the role played by Indonesia in the world. You can learn a lot here. Besides, the building is unique. It's worth your time. Interesting historical place. Good info plus all was in english too. Thumbs up! Nice place and good for photoshoot. Learn abaout KAA history. A recommended place for people wih interest in history. The info which could be found here is guaranteed to be a lot much more than just the one found on the internet.